Bioscan10 is a compact 4-slap scanner in full compliance with the â€œ10-print capture scanner & software user group requirementsâ€? 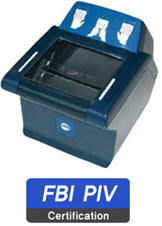 suitable for all applications in need of 10 fingerprints flat and rolled acquisition. main applications are visa issuing, e-id documents and criminal identification. 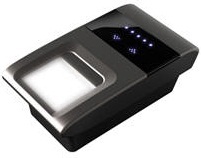 BioScan10 is alive fingerprint scanner, in conformance with international standards, for acquiring 4-slap/2-thumbs fingerprints as well as rolled fingerprints. Its small footprint and low weight increase mobility thus rendering BioScan10 suitable for desktop applications as well as for integrated solutions. An ergonomic design combined with an easy-to-integrate SDK architecture turning BioScan10 into the perfect choice for integrators and solution providers. BioScan10 integrates a 12 LED graphical user interface eliminating the necessity for skilled operatorsâ€™ thus increasing workflow efficiency. 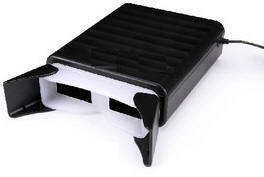 No silicon pad or heated glass platen is used resulting high reliability and low maintenance costs. BioScan10 is suitable for all applications that requiring 4-slapfingerprint acquisition including rolled fingerprints according to FBI IAFIS-IQS quality. 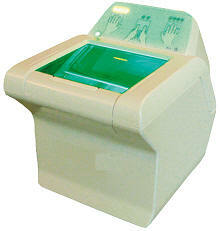 BioScan10 processes fingerprints faster, simpler and thanks to Green Bit unique software features more reliable compared to the traditional ink method eliminating the need for skilled operators. 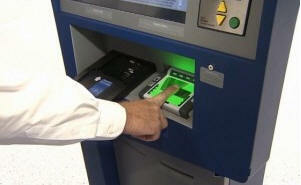 This revolutionary product represents a new age in digital fingerprinting. All civil and law enforcement applications requiring the acquisition of 10-prints will be fully satisfied by BioScan10 performance and quality. AUTOMATIC ACQUISITION STOP: Highest quality image selection during flat fingerprints scanning. ELIMINATION OF LATENT PRINTS: Elimination of latent prints originated from recent scans. HALO ELIMINATION: Elimination of halo due to moist fingerprints during acquisition. 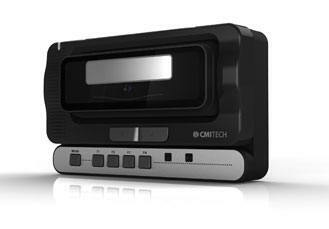 ROLLED FINGERPRINT CAPTURING: Display in real-time, self-adaptive to rolling speed and directions, seamless composite image generation, automatic stop detection. AUTOMATIC SEQUENCE CHECKING: Eliminates incorrect fingerprints sequence scanning. SEGMENTATION: Automatic splitting of four- slap and two thumbs fingerprint images in single fl at images. IMAGE QUALITY CHECKING: Dynamic estimation of fingerprint image quality during scanning process; NISTIR7151 quality check. 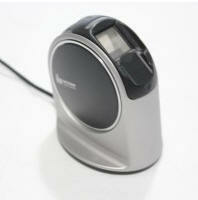 AUTO CAPTURE: Sensing of slap/single finger placement on the scanner. SLIDE DETECTION FOR FLATS PRINTS: Detects deformations of fingerprints due to sliding during acquisition. ANTI-FAKE â€œLITEâ€? : Distinguishes between real human finger patterns and other surfaces with relief structure (e.g. gloves, tissue). 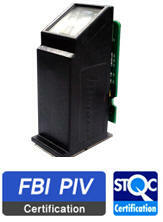 COMPRESSION: WSQ Compression â€“ FBI certified software to compress the fingerprint images, JPEG, JPEG2000 Output. FINGER ALLOCATION CHECK: Checks presence of finger core, and basic/ distal flows. STANDARD OUTPUT FORMAT: Creation of â€œANSI/NIST-ITL-1-2007â€? type 1, 2, 4 and 14 records â€“ EFTS71 output format support. 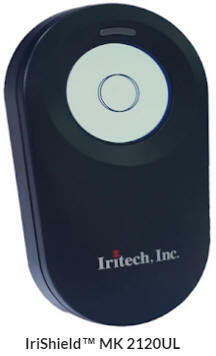 FINGERPRINT SCANNER Plain four fingers up to 3,2â€? x 3,0â€? â€“ Two plain thumbs up to 3,2â€? x 3,0â€? Flat finger up to 3,2â€? x 3,0â€? â€“ Rolled finger up to 1,6â€? x 1,6â€? Jeevan Pramaan is a biometric enabled digital service for pensioners. 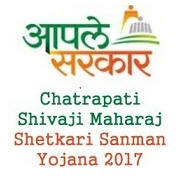 Pensioners of Central Government, State Government or any other Government organization can take benefit of this facility. 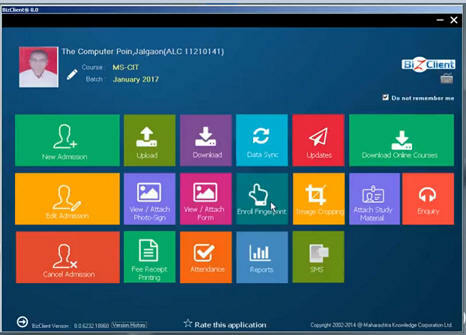 Under this facility pensioner person is required to purchase fingerprint scanner and then by using jeevan pramaan application he can register himself online and download pensioner certificate. Our Enbioscan C1 model is compatible to work with this application. 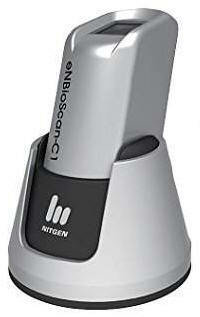 Enbioscan C1 is also compatible to work on Skill Development program . This scanners are being supplied to MKCL ( Maharashtra Knowledge corporation Ltd ) who are using this for their skill development program. 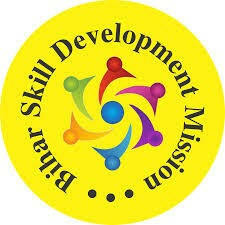 Main purpose of using scanner for MKCL is to register persons using fingerprint scanner who are opting for various courses for skill development mission. Pradhan Mantri Kaushal Vikas Yogna is implemented differently in different states in bihar its called bihar KVY or skill development mission and there they use Nitgen Enbioscan C1 usb fingerprint scanner with desktop software developed by MKCL. 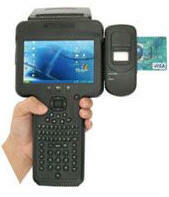 Enbioscan c1 is compatible to work on AEBAS devices. We have done integration for the same and using this attendance is recorded. This device is being used by "Government of Jharkhand" where in all over zarkhand state Enbioscan C1 model is being used for providing attendance. 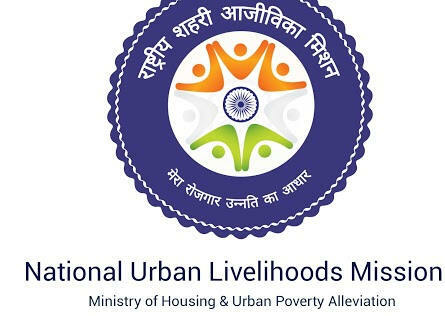 (National Urban Livelihoods Mission ) : National Urban Livelihoods Mission (NULM) was launched by the Ministry of Housing and Urban Poverty Alleviation (MHUPA), Government of India in 23rd September, 2013 by replacing the existing Swarna Jayanti Shahari Rozgar Yojana (SJSRY).The Mission is aimed at providing shelter equipped with essential services to the urban homeless in a phased manner. For this project our eNBioscan C1 device is suitable. Bioenable Technologies has been selected by the Regional Transport Office (RTO) of Pune to develop fingerprint technology that will be used for driving license registration in the city. 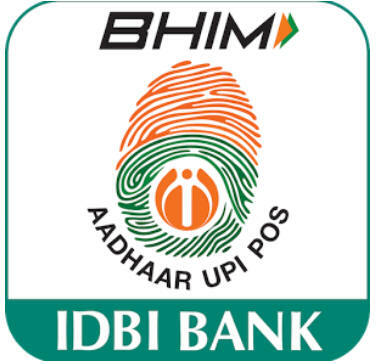 BHIM DIGITAL POS App empowers merchants/traders to collect payment from its customers from both UPI and AEPS (aadhaar enabled payment services). This App enables merchants to accept payment from all UPI Apps and also based on Aadhaar number of its customer. It has a simple interface wherein the merchant needs to enter the amount and order details to generate the QR code instantly. Customer can scan this QR code from any UPI App to make instant payment to the merchant. Alternatively, merchants can also download QR code from BHIM DIGITAL POS App and stick it on billing counters. Customer purchasing goods or service from the merchants can scan this QR code from any UPI APP and make payment instantly. 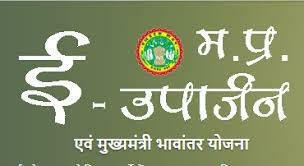 Merchants can also collect payments by using customers aadhaar number and fingerprint authentication. Once the payment process is complete, a confirmation message will be displayed on both the customer’s App as well as on merchant’s App. The Horticulture Department manages spices, medicinal and aromatic plants along with production and maintenance of fruits, vegetables and flowers. Compared to traditional crops produced by farmers, cultivation of horticultural crops is a highly specialized, technical and profitable venture. Apart from this, due to the majority of horticulture crops, in nature, they need a systematic plan for their development. Horticulture development has taken more importance in recent years as it has been identified as beneficial for the diversification of land use of this area, which provides an increase in employment opportunities, better returns in per unit area and nutritional gap In addition to filling. 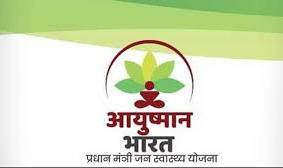 Farmers of Haryana have also started horticulture crops as a separate viable economic activity. 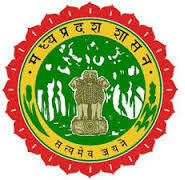 To promote the development of horticulture in the state, the Haryana Government created a separate department of Horticulture Department in 1990-91.